Crab legs are a wonderful seafood choice, but you might not know what to serve alongside them. A variety of butters and side dishes will complement the seafood and make your crab leg meal memorable. First and foremost, crab legs cry out for butter. That's because the sweet, succulent crab meat blends perfectly with the rich flavor of butter. 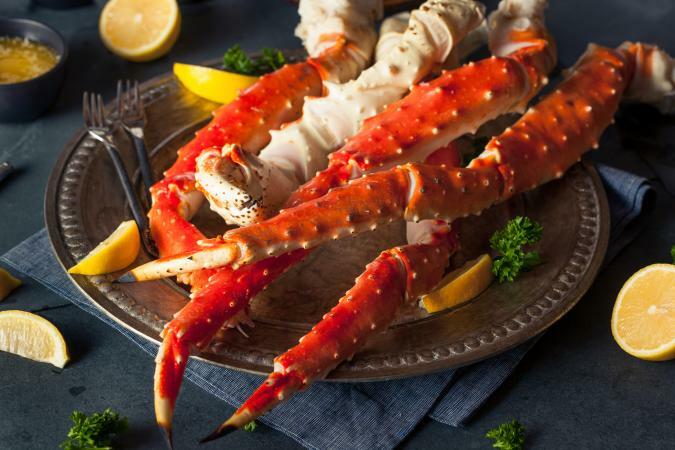 In seafood restaurants, drawn butter is typically served with crab legs. Before you think all butter is equal, however, know that there are a number of different types of butter that impart different flavors. Keep in mind that in this case, butter refers to real butter and not margarine. Many grocery stores carry something that is labeled as seafood butter. It can be found on the shelf - not in the refrigerated section. Seafood butter is merely clarified butter, which is shelf stable and can be stored in the pantry away from refrigeration. It's easy to make your own clarified butter, and it is usually less expensive than buying seafood butter or ghee. To make clarified butter, melt the butter in a saucepan and then let it cool slightly so that the milk solids settle to the bottom of the pan. Spoon off the clear liquid on top. This is clarified butter. Plugra is an American butter that has a higher butterfat content and lower water content than other American butters. This results in an exceptionally sweet and creamy butter that has a richness that compliments the sweetness of the crab nicely. Plugra can be found in specialty markets and upscale grocery stores. Irish butter is similar to plugra in that it has a higher butterfat and lower water content, resulting in a creamier character and smoother mouth feel that complements the sweetness of crab. Lemon butter is clarified butter or ghee that has been slowly browned and then whisked with three tablespoons of lemon juice for every half cup of butter. The lemon flavor in the butter adds a nice hit of acid to the sweet of the crab and the fat of the butter, leaving a nicely balanced palate. Beurre blanc is a white butter sauce that is made from butter, white wine, vinegar and shallots. The vinegar, white wine and shallots simmer together until reduced, and then very cold pats of butter are whisked in a few at a time until you get an emulsified creamy sweet butter sauce. Buerre blanc is a terrific alternative to butter to serve with crab. With the sweetness of the crab legs and the richness of the butter, many people like to introduce acid to cut through the rich and sweet and balance out the flavors. This is why a wedge of lemon is traditionally served with crab. When serving your crab legs, place wedges of lemon on the plate next to the butter. Crab legs sometimes serve as a side dish. In this instance, they are traditionally served with steak. Steak and crab is a perennial steakhouse favorite, and there's no reason why you can't serve this favorite at home. Choose any cut of steak that you enjoy - from a delicious filet mignon to a hearty rib-eye - and grill it up. Add a side of crab legs and butter, a baked potato, and steamed vegetables, and you have a memorable steakhouse style dinner at home for a fraction of the price of eating out in a restaurant.